Saturday morning we headed with our high school friends (who came down for the weekend to visit us) to the LA Farmers Market. The market, located at Third and Fairfax near the CBS studios, dates to 1934. 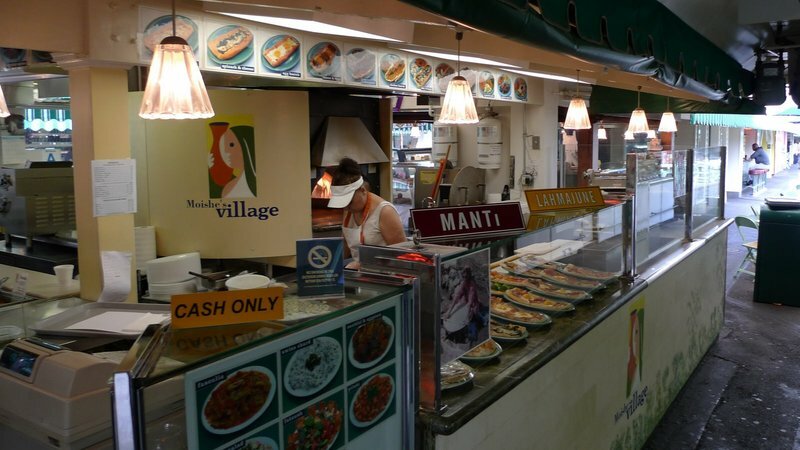 This was my first visit and I was impressed with the range of different food stalls. I didn’t look around the entire market, but my impression is that there aren’t really that many farmers offering their wares. Here is a look at some of the food we tried. There are lots of seating areas, mostly in the shade. You can order from different vendors and still sit at the same tables, which give you a lot of flexibility. We were there by 10:00 Saturday morning and it wasn’t very busy, although by the time we left things were notably busier. Hard to tell the breakfast from the desserts! 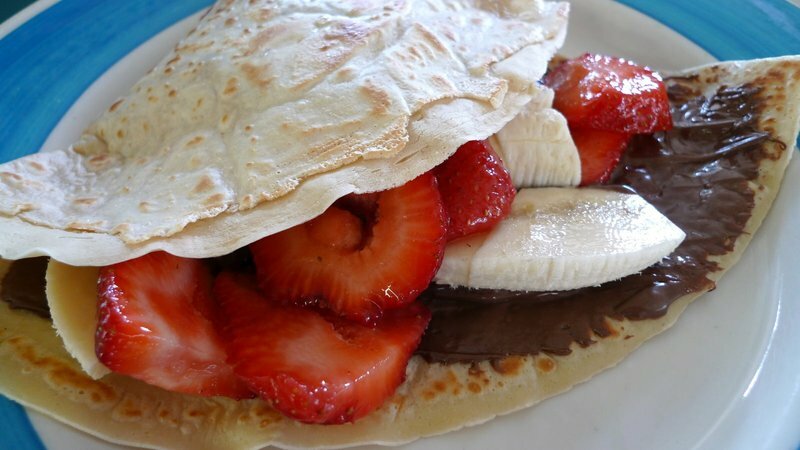 Crepe with chocolate, strawberries, and bananas. Ran into a place called Moishe’s Village, which serves Middle Eastern food. My attention was caught by the borekas, a flat bread with toppings cooked in a brick oven. Basically, oblong pizzas without tomato sauce. 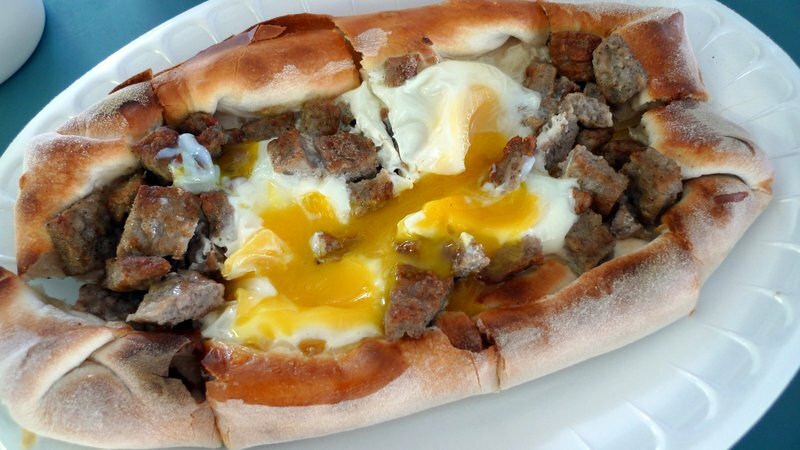 I chose the sausage and egg and asked the lady to cut it into pieces. She scolded me, saying that I should have ordered scrambled eggs so it would have cut more prettily. 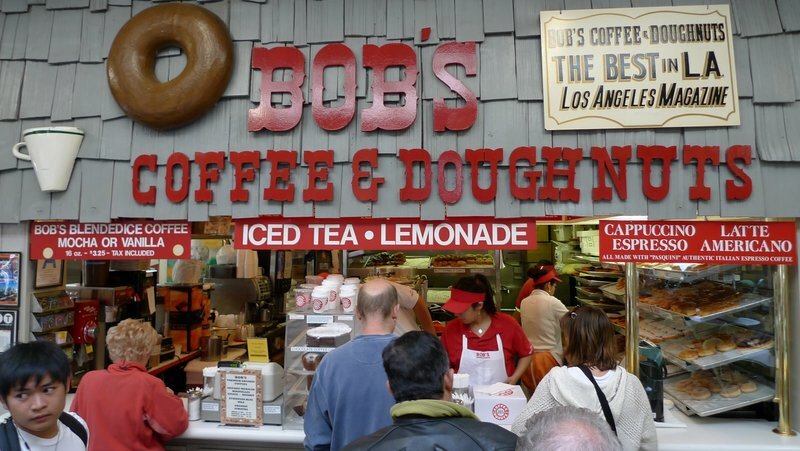 Another popular spot is Bob’s Coffee and Doughnuts. Yeast donuts. Very tasty, although I’m not a huge fan of donuts. Tawn in his market gear. 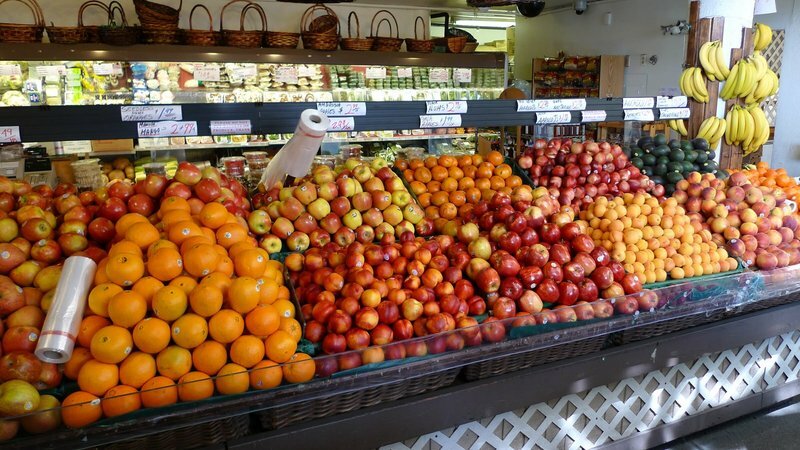 Loads of fresh fruits, especially the peaches, apricots, and nectarines. Stone fruits are my favorite reason to come back to the US during the summer. 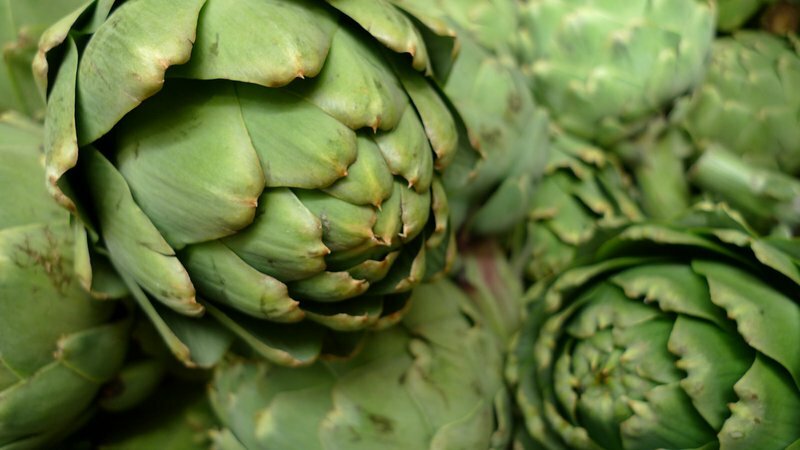 Close up on the beautiful artichokes. 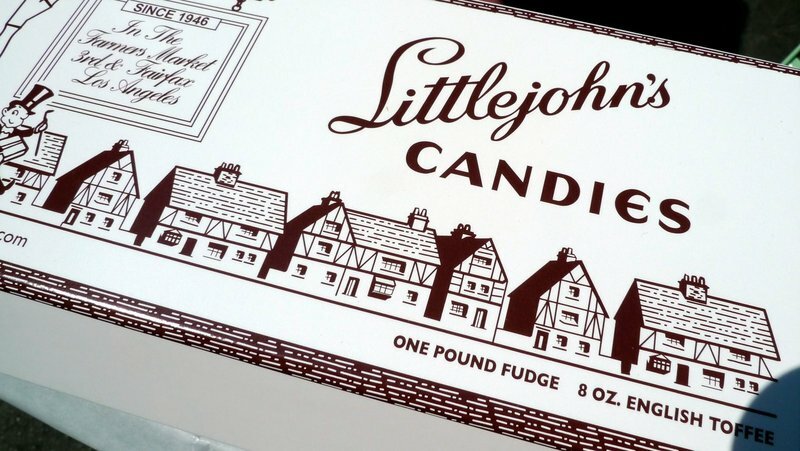 Afterwards, one of my friends insisted that we must try Littlejohn’s English toffee. The picture doesn’t do justice to the toffee, but it was pretty good. Not as hard as a lot of toffee, so much easier on the teeth to eat. Well, except for all the sugar. We were going to go cherry picking afterwards but when we called ahead to the farm, we learned that thanks to the cool weather, cherries are coming in a few weeks late. Sadly, no cherry picking this trip. 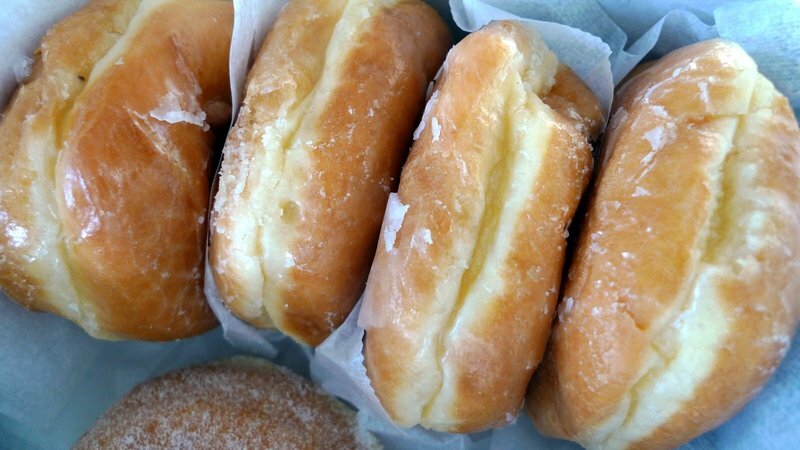 This entry was posted in Uncategorized and tagged Angeles, Bob's, Dining, Doughnuts, Farmer, Farmers, food, kitchen, Littlejohn, Los, Los Angeles, Market, Moishe's, Toffee by christao408. Bookmark the permalink. i love farmers makets :)this is an amazing post, i always enjoy you pics!i can’t wait to see cherry picking pics! So much food! So little time! 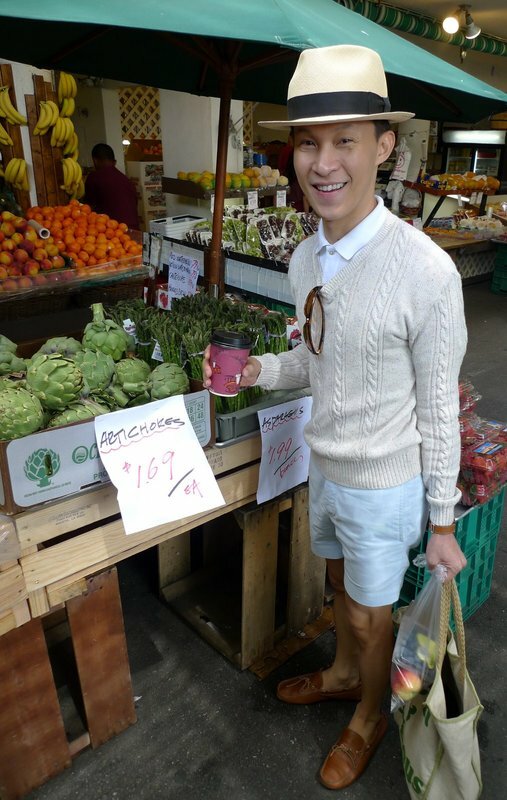 Haha~got scolded at the Farmer’s Market! 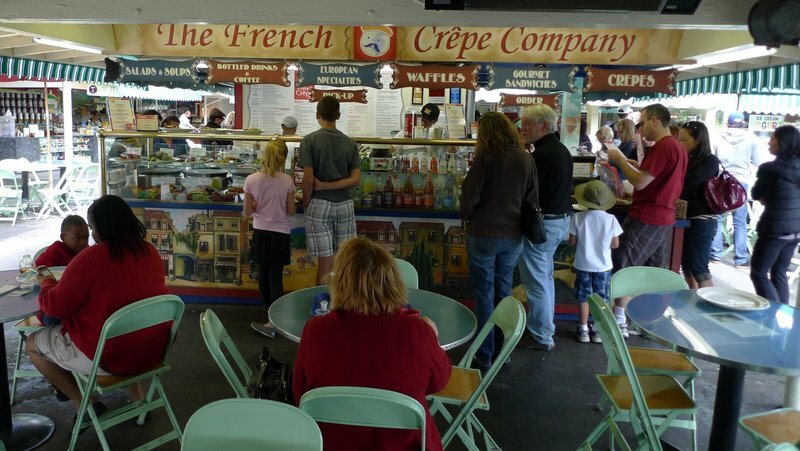 The crepe place is pretty popular indeed, I caught a few starlets eating there in a number of occasions. I haven’t been to the Farmer’s Market for a while, but when I was a kid in Santa Barbara we would make an annual trip to the Tar Pits, the shopping along Wilshire Blvd, and the Farmer’s Market for lunch — then downtown to the Natural History Museum! It was one of my favorite days of the summer each year, and the Farmer’s Market still hasn’t changed much (that was the early/mid-50’s). CBS and the whole 3rd & Fairfax corner are still pretty much the same — The Grove shopping center down the block is quite new, and a real departure from what was there before. The shot of Tawn and the veggies, and the next 2 shots could have been shot way back when! There’s a stall selling Brazilian steak, chicken and sausages which always have long queues plus their popular cheese rolls. That was my favourite at the Farmers Market! The farmers’ market is here twice a week. Wednesday and Saturday. Beautiful food and produce. I enjoy shopping there and most are organically grown. i haven’t wandered around the la farmer’s market very often, but i also got the impression that it was more vendors and less farmers selling their produce. i like the farmer’s market in baltimore, but don’t often get a chance to get down there. i really should try to shop there more often, though, because the produce is usually better, and it’s good to support local farmers. I was also a little bummed at the lack of “farmers” there. 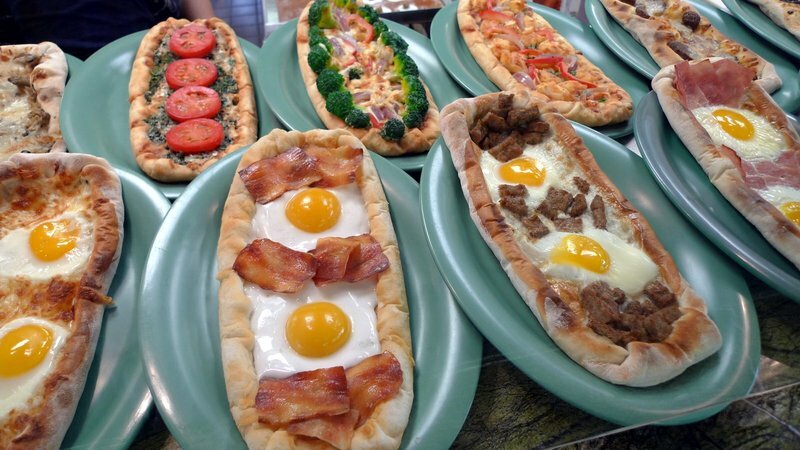 But the food is delicious and it’s fun to try so many different kinds of food there. 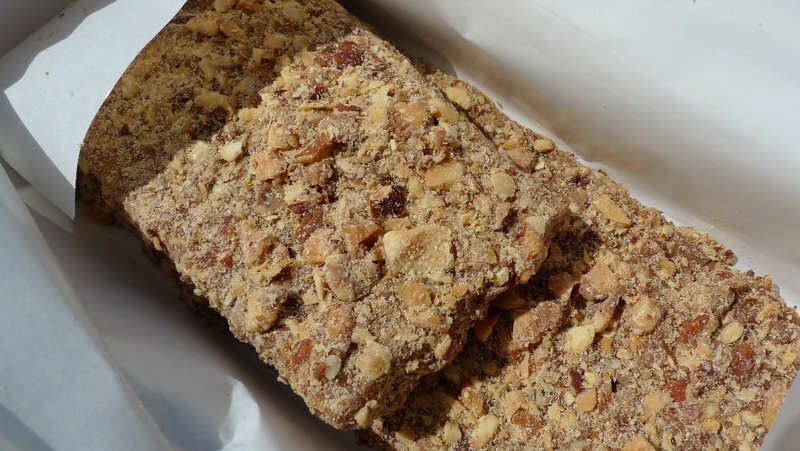 A boreka has been what I plan to eat on my next visit. The weather has been very gloomy this June. I hope the girls aren’t disappointed being at the beach.BTW, Bill and I are headed to Los Alamitos for some food truck fare tonight if you want to sneak away and join us. Tawn is always so appropriately dressed. I love it! those borekas look really good! and i would have gone with the choice you went with! Farmers Markets are so much fun to just walk around. 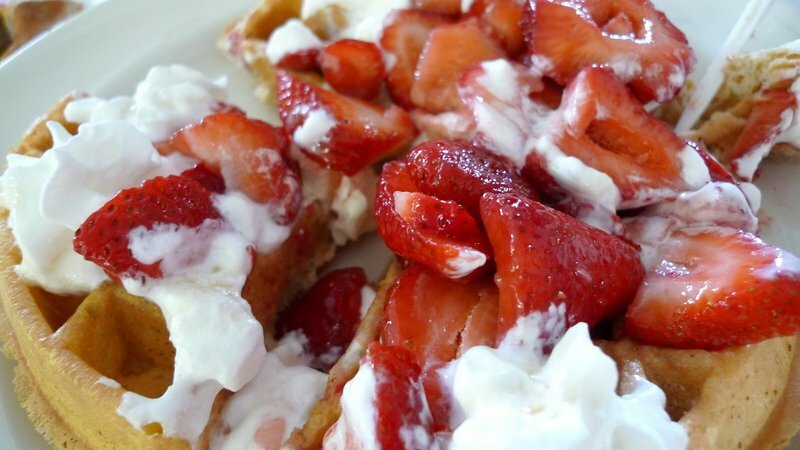 The crepes and the Belgian waffle take the cake. That is not the real LA farmer’s market…That’s just a remnant of a farmer’s market attached to the Grove. I went there before thinking there would be more fresh produce, but I was disappointed to see that it was mostly food vendors. It’s still a great place to hang out and try different foods though. Have you ever been to the hollywood farmer’s market on Sundays? Oh the borekas look wonderful, may have to whip up a version next week~ looks so delicious.Yay for market gear! Interesting post Chris, as always! Love Tawn’s outfit, so neat-looking! I think I will like this place. So much yummy food. The crepe looks so good! There is a (new-ish) cafe near my place and they have really good crepes too. I think I’ll go have one for breakfast tomorrow. Those borekas look very mouthwatering. I’m not a big fan of whipped cream actually (lactose issues). We have our little farmers market in our neighborhood starting up for the summer now! moishe’s is also my fav too! เจ้าของเว็บไซต์ ที่ยอดเยี่ยม เนื้อหา เป็น ที่คุณได้ เว็บ อาจจะ มาก มีประโยชน์ กว่าที่เคย .